I've just recently upgraded my old tired craftrobo for a silhouette portrait. My robo was a lovely little machine but the motor was going and it couldn't cope with anything too thick. The portrait is lovely, it just so much better! I was looking through the silhouette store and I found these box cards designed by Lori Whitlock. They are so cute! I think I bought about 6 of the files in one go and then went back for more. I then looked at her blog and found that there was a link up party! 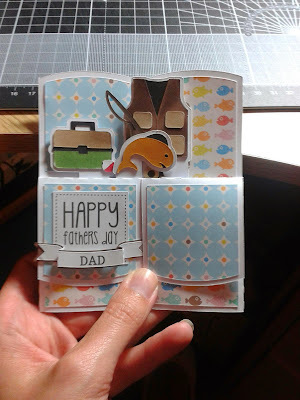 So here is my box card for my father-in-law who, obviously, loves fishing! The papers are digital ones from the splash collection by echo park, I coloured the elements (like the fish) with my copics and I designed the sentiment on the computer. My Name is Jo, I've been happily married for 16 years, have a 10 year old daughter named Ellie and we live in Kent in the UK. 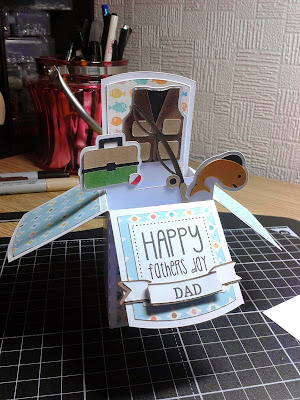 I've been making cards since just after my daughters 1st birthday and I love it! I mainly make cards for my family and friends and I do a little commission work occasionally too. I love decoupage, digital and rubber stamping and also do a little cross stitch when the mood takes me.